Water is the chief agent of weathering and erosion on Earth. Mars is a much drier, colder planet on which liquid water cannot exist very long at the surface because it will immediately begin to boil, evaporate, and freeze--all at the same time. However, new pictures from the Mars Orbiter Camera (MOC) onboard the Mars Global Surveyor (MGS) have provided an astonishing observation which suggests that liquid water may have played a role in shaping some recent gully-like features found on the slopes of various craters, troughs, and other depressions on the red planet. These pictures introduce the basic features of a martian gully. 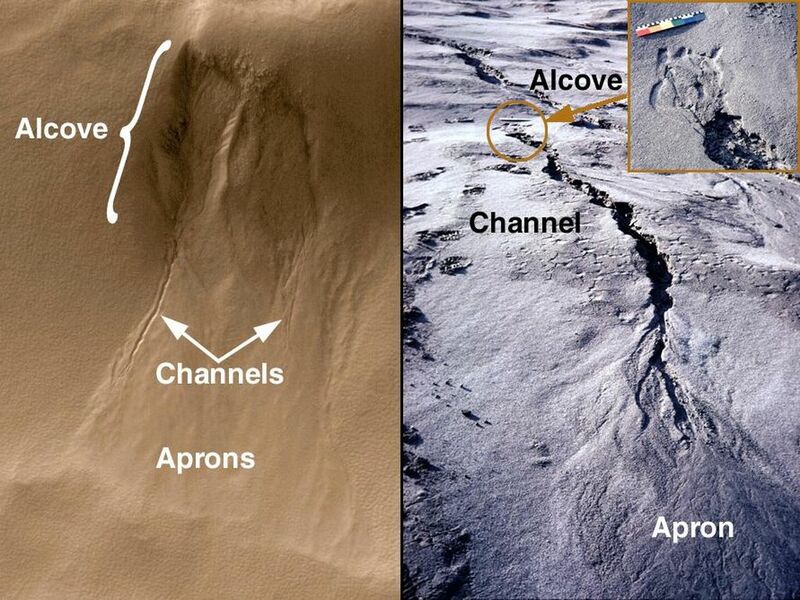 The figure on the left is an example from Mars, the figure on the right is a gully on Earth. In the Earth picture, rain water flowing under and seeping along the base of a recently-deposited volcanic ash layer has created the gully. For Mars, water is not actually seen but is inferred from the landforms and their similarity to examples on Earth. The landforms both on Earth and Mars are divided into three parts: the alcove, the channel, and the apron. Water seeps from between layers of rock on the wall of a cliff, crater, or other type of depression. The alcove forms above the site of seepage as water comes out of the ground and undermines the material from which it is seeping. The erosion of material at the site of seepage causes rock and debris on the slope above this area to collapse and slide downhill, creating the alcove. The channel forms from water and debris running down the slope from the seepage area. The point where the top of the channel meets the bottom of the alcove is, in many cases, the site where seepage is occurring. Channels are probably flushed-clean of debris from time to time by large flash floods of water released from behind an ice barrier that might form at the site of seepage during more quiescent times. 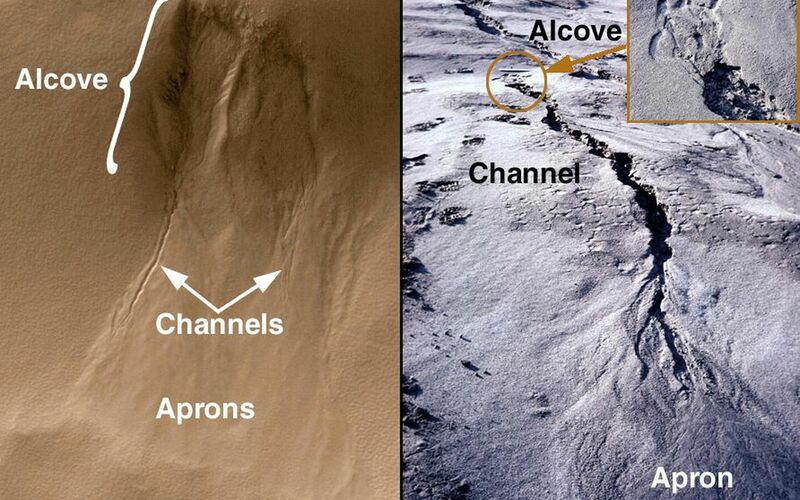 The aprons are the down-slope deposits of ice and debris that were moved down the slope and through the channel. Whether any water--likely in the form of ice--persists in these deposits is unknown. 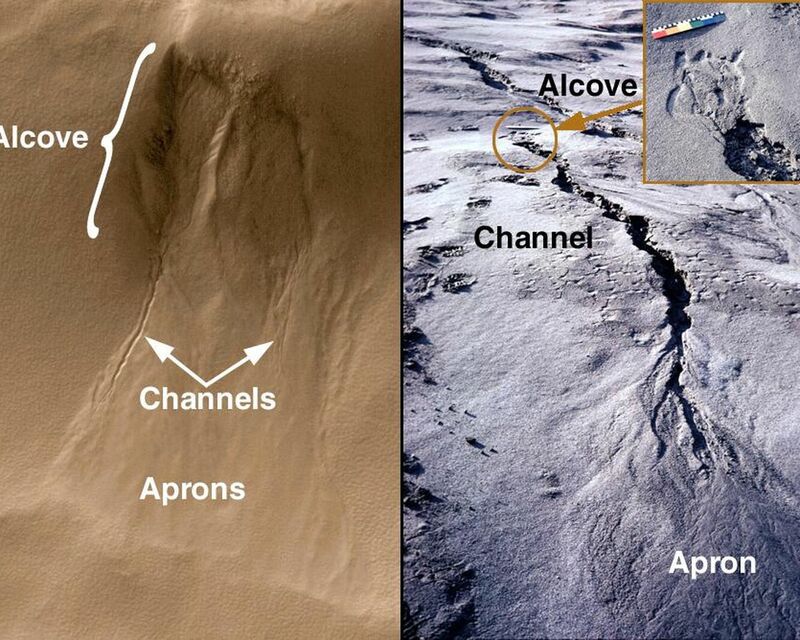 The fact that the aprons do not go very far out onto the floors of craters and troughs (e.g., the foreground of the figure on the left) indicates that there is a limit as to how much water actually makes it to the bottom of the slope in liquid form. Most of the water by the time it reaches the bottom of the slope has probably either evaporated or frozen. The MOC image on the left was acquired July 3, 1999, and is located on the south-facing wall of an impact crater near 54.8°S, 342.5°W. The MOC image is illuminated from the upper left; north is toward the upper right. The MOC image covers an area 1.3 km (0.8 mi) wide by 2 km (1.2 mi) long. The pictures from the flank of the Mount St. Helens volcano in Washington (right; large image and inset) were taken by MGSMOC Principal Investigator, Michael C. Malin, in the 1980s after the eruptions of May 1980. They are illuminated from the left; note footprints on left side of the picture for scale, also note the colored bar, which is 30 cm (11.8 in) long.